I'm a time pirate—born in 1810, now a 21st-century woman. I travel through time trying to right wrongs without disrupting the fragile balance between what is and what can never be. That's why it's vital that I go to 1836 and find the man who conned my brother out of his Time Travel Mechanism as quickly as possible. If the technology falls into the wrong hands, it could change the world as we know it. The notorious Duke of Leister definitely qualifies as the wrong hands. An amateur scientist of the slightly mad variety, he's bound to figure out how to use the TTM sooner rather than later. I requested this ARC from NetGalley having seen a lot of good reviews appearing around the internet and I wasn't disappointed. I am still pretty new to steampunk, but am growing to love the genre. This was a beautifully crafted novella with vibrant characters and a wonderful storyline. I read this book in less than an hour and was engrossed from start to finish, always wondering what would happen next. 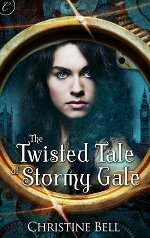 The premise of the story engages the reader right from the start and Stormy Gale is an exciting narrator who takes you with her on the journey. Good prose and dialogue, excellent characters and a twisted tale to keep you on the edge of your seat.